We have been having so much fun this week featuring the amazing products from Scor-Pal and their designers too!! Have you been over to their blog yet?? If not, you should jump over there and look at today's and the past couple of days. 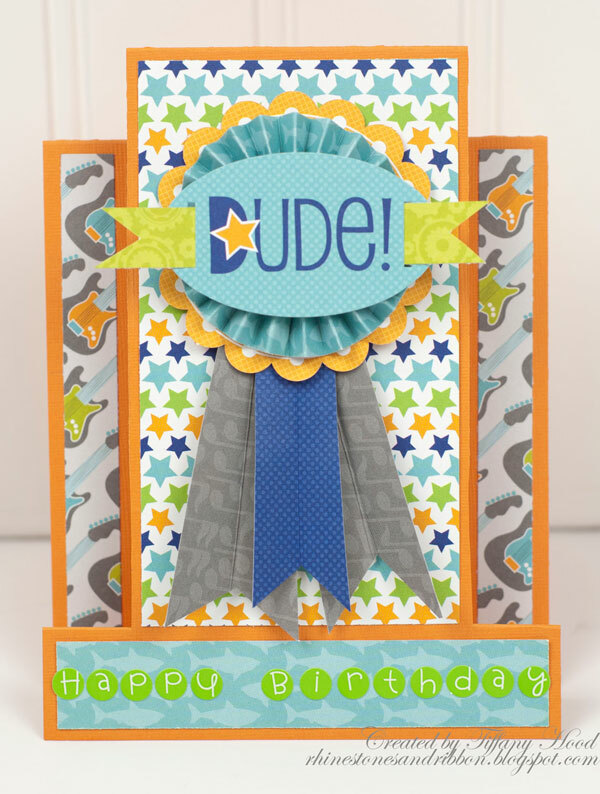 They've been creating amazing projects with Doodlebug products and both blogs are giving you the chance to win. Remember we're giving away a full size Scor-Pal and also a Scor-Buddy. Each of those will be combined with some Doodlebug products. All you need to do it leave a comment here on our blog. Bonus entry if you go leave a comment on Scor-pal's Facebook Page letting them know why you like their tools or which of the projects you've seen on either blog that inspires you. Leave a comment once you've done that. We are so lucky to have projects from three of our Design Team girls Aphra, Jing-Jing and Tiffany. Visit Aphra's blog today to get the pattern for the flip flops and she share show she created the fun embossed pattern behind the title. 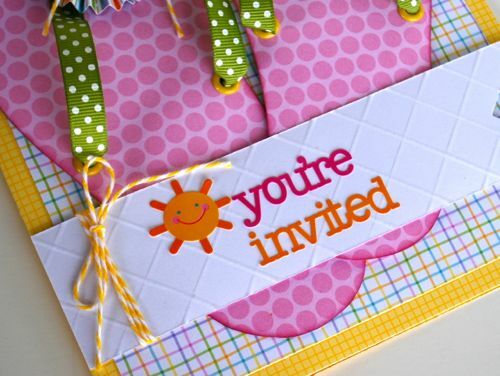 Supply List: Bumblebee Petite Prints Cardstock; Hello Spring Patterned Paper; Limeade Boutique Buttons; Bumblebee Doodletwine; Multicolor You're Invited Doodles Cardstock Stickers. The Scor-Pal was a lot of fun to use! Here I made a multi-dimensional card base by cutting and scoring a regular piece of 12" x 4.5" cardstock. Then I embellished it with a scored rosette with scored tails. I love how this tool adds so much dimension and interest to any project. I'll have a full step-by-step photo tutorial over on my blog showing how I made the card base and the rosette. That flip flop card is just too cute! Love it! Great cards and adorable, fun papers! love the cards, especially the summery flip flop one cute!! Love all of the adorable projects! Especially adore the flip flops! What fun projects! Love those flip flops! Posted on Scor-Pal's FB page too! Super cute! I will make sure to take notes on these cards! All 3 are really cute. 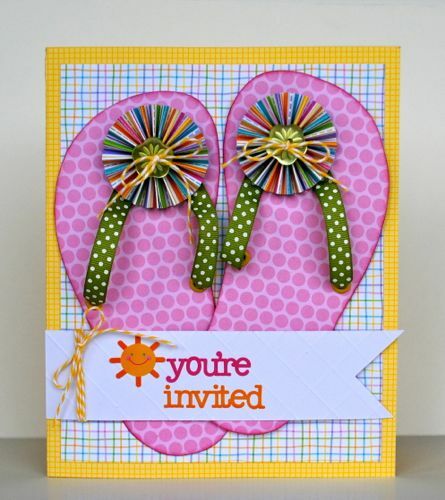 The flip flop card would be great for a summer birthday, or a beach party invitation. I posted on Scor-pal's Facebook page. Great job DT! I love the cross hatching on the gate fold card. I have a Martha Stewart scoring board, but I wouldn't try that as the bone folder often pops out of the grooves so it wouldn't look good. That made me think that maybe a Scor-pal is in my future! love the Dude Card..always need 'dude' card inspiration! Great cards ! I love the Flip Flop card. Super fun! So much wonderful texture and interest! 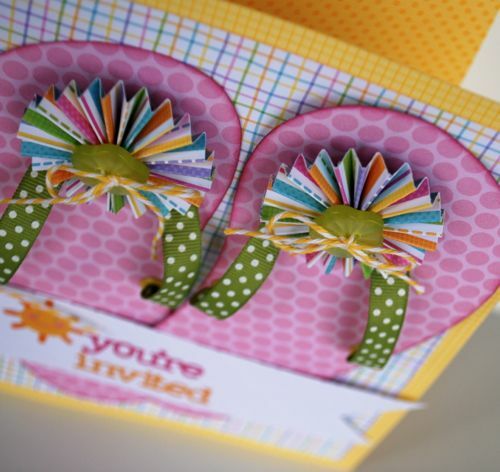 The flip flops really are my fave with the rosettes, the ribbons and the scoring on the sentiment banner! TFS!!!! Following you on Pinterest. Lots of great projects. Great cards..love all the different folds. I am loving these fun Doodlebug projects! Your products are so cute! And I commented on the Scor-pal blog too! Great projects! I absolutely adore the flip flop card. Such cute projects!! Love all the ways to use a Scor Pal! I left a comment on Scor Pal's FB page! amazingly gorgeous cards! love the ribbon on the dude card and the flip flops card is so cool. Visited Scorpal on facebook and left my fave project. I love the cards made with the scor-pal. They look like fun. The flip flops are great for a summer birthday. Love the flip flops with fan and also the others! I posted on Scor-Pal FB. Wonderful cards! Love the papers and colors everyone used. These are amazing!! Love those flip flops! I commented on Scor-pals's FB page. I really like the rosettes on the flip flop card. I left a comment on Scor-pal's Fb page too! I left a message on ScorPal's blog! I love that the ribbons are used as the straps on the flip flops! That's such a cool idea! I've left a comment on Scor-pal's Facebook page! Beautiful Projects. love the flip flop card the Detail is Amazing. I love the Multi- Dimensional cards they are super thanks for sharing and for the chance to win. Beautiful cards!! Love the bright cheery colors. I love these projects today! So many fabulous ides. Awesome!! NOTHING says "Summer" like flip flops! 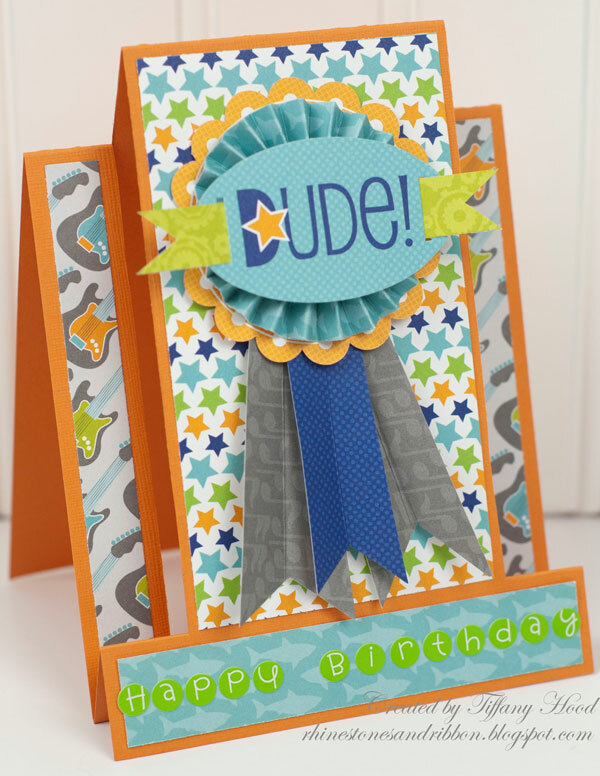 The Dude card with the guitars paper is inspired! And the Happy Birthday card screams "Party!" I really like all three cards... Nice job! I love them all- great paper- awesome colors- fabulous projects! Can't wait to make the flip flop card for my niece's birthday, she will love it! I also love the other two designs. Thanks for the wonderful ideas. I left a comment on the Scorpal Facebook page. Great job to all the project designers this week!! OMGoodness! These cards are fabulous! Can't wait to try out that flip flop card! Cute, cute cards!! Great job! I want to win so I can learn to make those awesome rosettes! 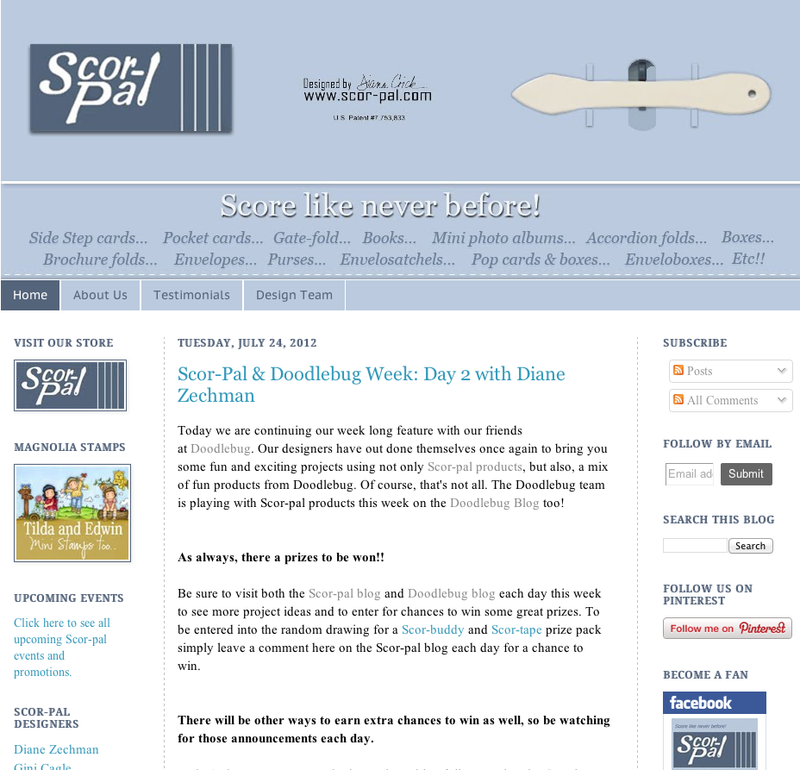 Went to Scor-pal's facebook page and shared my thanks for an awesome product. 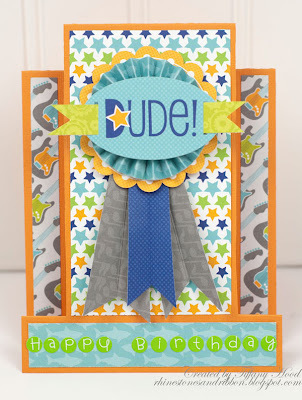 I LOVE these ideas - amazing what some folds and great doodlebug products can create! They are so clever, cute and Amazing!! Wow! Awesome cards. 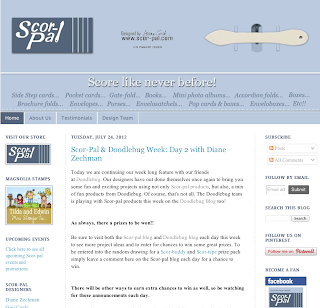 Great to see the Scor-Pal and beautiful DP in action. The birthday card is wonderful! I love the mix of colours! Great birthday cards. I needed some new ideas and these are perfect. I'm so loving those flipflops! Pinning it for later. This is so fun! Left a message for Scor-Pal on FB.